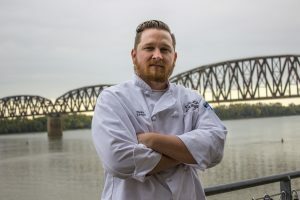 Chef Zachary Overfield is a born and raised Hendersonian, having grown up in the East End and still residing in the neighborhood. He’s successfully managed multiple kitchens and is currently head chef and culinary instructor at Earle C. Clements Job Corps. Join us each month for Chef Zach’s culinary adventures around Henderson! December had me craving some decadent desserts during the holiday season. This month, I’m sharing my four favorite delightful, made-from-scratch desserts that are sure to satisfy your sweet tooth! 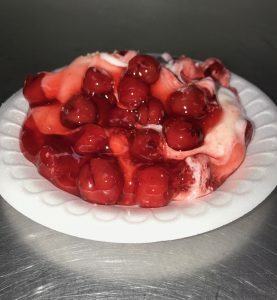 The first on our list is J & B Barbecue, not normally known for desserts, but if you ask around town everyone will tell you to try their Cherry Delight. This is very rich and creamy and always very delicious. The cherry pie filling adds a tartness and balances out nicely with the sweetness of the whipped cream topping. All in all, this is a very balanced dessert that everyone is sure to love! The next stop on our list is Eastgate Family Restaurant, where they are known for homemade, made with love desserts. 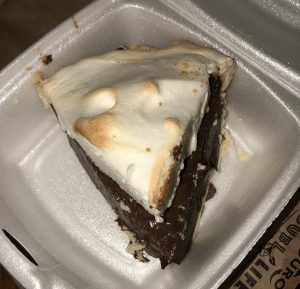 Eastgate Restaurant makes numerous desserts from pies to cakes, but we’re going to focus on my favorite, the chocolate pie. I spoiled myself with this chocolate pie! It’s a true dinner classic. Luxuriously creamy chocolate filling is perched atop a flakey, buttery crust. Rounding out the experience is the freshly fluffed meringue. This pie is a sure table pleaser! 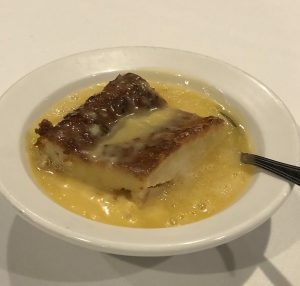 You can’t visit Henderson and not walk into Rookies Sports Bar and Restaurant to try a piece of Joyce’s bread pudding. This bread pudding is a guaranteed pleaser. The original recipe was that of long-time employee and friend, Joyce King. This is a great nostalgic holiday dessert with its warm flavors of cinnamon combined with the buttery soft vanilla rum sauce. It is a must have when dining at Rookies Sports Bar and Restaurant. 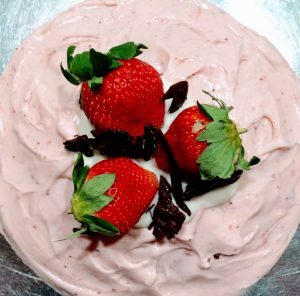 Lastly, we have Sidewalk Cafe’s strawberry cake, but don’t be fooled. Sidewalk Cafe’s strawberry cake is one of the most refreshing desserts on the list. This strawberry cake is a soft, sweet, and most importantly moist cake topped with a thin layer of icing that seems to ooze down the sides of the cake when sliced. This cake is a great dessert any time of year! If you enjoyed this week’s blog… Check out Chef Zach’s other Henderson food picks at this link!